Paddling on the Indian River was significantly different from paddling on the Wekiva. Rather than a narrow river canopied with various flora, the Indian River was wide and open with mangroves and mounds of shells. We began by putting in by J.B.’s Fish Camp in New Smyrna Beach where a daily fishing boat goes out to catch the special of the day. People harvest clams, mussels, and oysters in this area. We paddled along the shoreline, and watched as dolphins played around us, an occasional manatee bobbed his nose out of the water, and the pelicans sat atop of the posts. 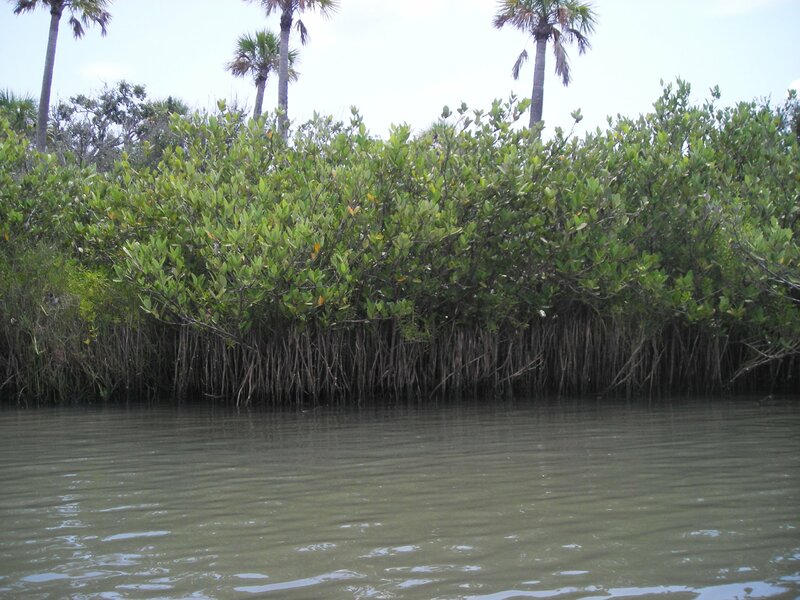 We ventured into the area around the mangroves. The flora included grasses and ferns, and we saw ibis, and egrets—including a great white—resting in the trees. The river ran deep and then suddenly shallow, and a couple times we had to push the kayak off a sand bar. It was actually refreshing to walk through the water. When we neared the mangroves and looked into the water, we saw masses of shells from oysters, clams, and mussels, and we were happy we had worn something on our feet! We ended the day with a late lunch at J.B.’s. We’re following you back at the college. Your experience reminds me of paddling a canoe on the Loxahatchee and getting a visit from some playful, back swimming otters. I hope you see some! I have yet to see a playful otter, but I still have the Loxahatchee in my future!